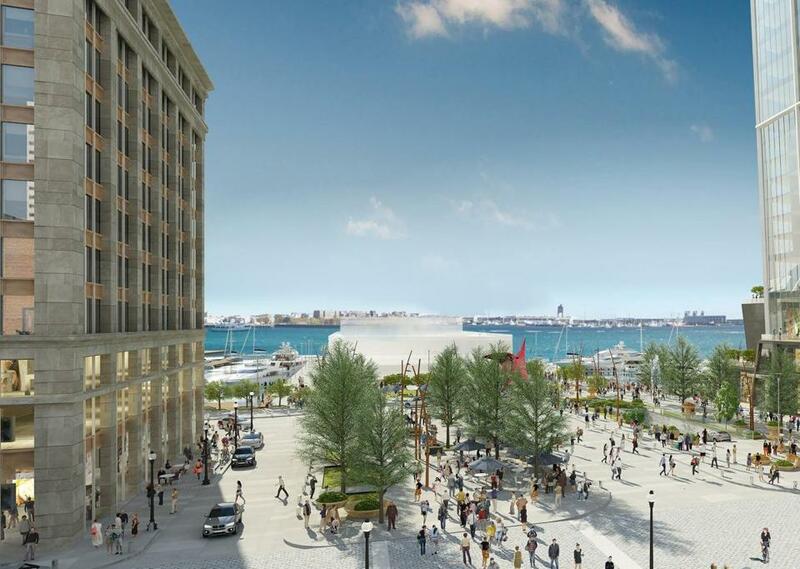 An image of a new plaza, dubbed the “Blueway,” that could be built at the base of a skyscraper Chiofaro Co. is proposing on the site of the Harbor Garage. A sliver of the tower is visible at top right. Now is an odd time for Don Chiofaro to turn coy. This past week, the brash developer released new renderings of his waterfront development project. They showed an attractive new plaza — but barely hinted at the 600-foot tower he wants to build right next to it. It’s a bizarre omission. A winning design could help banish doubts not just about the idea of a tower so close to the harbor, but also about Chiofaro’s overall vision and taste. Indeed, splurging on great architecture and imaginative open space is the developer’s best hope of saving his project amid a public debate that, all too often, gets hung up on the wrong things. A growing city needs more space. But whether the issue is four- to six-story buildings in neighborhoods or skyscrapers by the harbor, Boston has a weird phobia about height — a sentiment also reflected in state laws limiting building heights near the water. “If we’re not careful,” Conservation Law Foundation senior counsel Peter Shelley recently warned, “Boston Harbor will be walled off to those of us who are not wealthy and powerful.” The group is suing to block a new zoning plan that would allow up to 600 feet on Chiofaro’s site, plus a 305-foot tower a quarter-mile or so to the south — well above previous limits. But Chiofaro’s site isn’t virgin tideland. The water is already walled off by the above-ground Harbor Garage, a vast parking complex that occupies an entire block. If anything, the new zoning will tear down a barrier and open up access for pedestrians; it requires 50 percent of the current garage site to be open space. Then again, improving on the status quo is also the goal of planning. And getting rid of the garage is no easy undertaking; neighbors, including the New England Aquarium, use hundreds of spots there. To justify the cost of furnishing ground-level amenities, tearing down a revenue-generating garage, and building replacement parking downtown, the developer needs to build a lot of square footage on the remaining 50 percent of the site. It’s unlikely to work under existing height limits. To illustrate the horror of waterfront skyscrapers, critics often point to the Harbor Towers — twin 400-foot-tall buildings, completed in 1971, right next door to the garage. But the problem with the Harbor Towers isn’t that they’re towers. It’s that the developers took a broad swath of precious waterfront property at ground level and fenced it off as a private lawn. If the top 380 feet of the towers miraculously vanished tomorrow, it wouldn’t help in the slightest. The travesty is what’s on the ground. “A lot of people are afraid of heights,” the comedian Stephen Wright famously joked. “Not me; I’m afraid of widths.” So am I. On Chiofaro’s project, the thing to watch is the girth. Under public pressure, developers often relent on height and compensate for the lost space by making remaining floors fatter. That’s the wrong approach here. Would a svelte 600-foot tower would be healthier for Boston’s waterfront than a shorter, fatter building that’s harder to see around? A thousand times yes — especially if the new building is designed well. Unfortunately, it’s far easier to fight about height than to coax good design out of a convoluted development-review process. As the beloved John Hancock tower shows, it’s possible to build a slim, airy, minimalist structure that wears its height lightly. For his Harbor Garage project, Chiofaro hired Kohn Pedersen Fox Associates, whose work includes the Shanghai World Financial Center — widely renowned as a model of subtle elegance, despite being a whopping 1,600 feet tall. For better or worse, International Place is the only data point Bostonians have to judge what Chiofaro’s harbor tower might look like. In interviews, he and his team talk more about the economics of the Harbor Garage project — which they liken to solving a Rubik’s cube, given the many competing demands the marketplace and land-use requirements impose — than about any artistic aspirations. In a city where even the mayor has complained about the architecture, it’s no wonder Chiofaro is struggling to close the deal. Chiofaro has made his own task harder in other ways. In his new renderings, there’s a sunny plaza connecting the Greenway to some future incarnation of the aquarium. Too bad he didn’t check with officials there first. “Instead of providing images and basic details of his own proposed development as requested by neighbors for years,” aquarium board chair Donna Hazard told the Globe’s Tim Logan, “the Chiofaro Company saw fit to redesign their neighbors’ property and present it to the public without any consultation or notice.” Ouch! At the risk of stating the obvious: Chiofaro should stop alienating people he needs as allies. But he also needs to come forth with specifics that can win other people over. City and state regulators have done Chiofaro a great service. In exchange, he owes the city a landmark — something that works well at ground level and that’s easy on the eyes of the Bostonians who’ll be looking at it for the next half-century or longer. So, let’s see it. Chiofaro has never been bashful before, so why start now?